I’m not a fan of John Edwards. I think he is far too liberal to be President and I believe his image as an advocate for the poor is a sham. I’m also not a fan of Bill Maher. Maher is a dedicated liberal, so perhaps I shouldn’t have been surprised when he replied to a question from Bill O’Reilly that he thought Edwards had the best chance for the Democrat nomination. I’ve never had the opinion that Maher wasn’t smart, but I just can’t imagine that anyone who analyses Edwards’ performance could think he can win the nomination, or should be elected President. 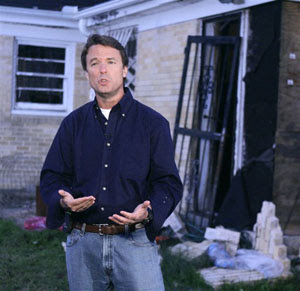 The reality of just who John Edwards is continues to seep out, and his missteps continue to mount. At a campaign stop in Iowa, Edwards, who made his considerable wealth as a plaintiff’s lawyer, called conservative columnist Ann Coulter a “she-devil,” escalating a feud with Coulter that began when she jokingly called Edwards “gay.” Without defending Coulter’s crude remark, Edwards’ reaction is just not acceptable in a potential President of the United States, a position that requires staying out of the gutter and not shooting off your mouth before you think. Imagine if as President, he responded to the leader of some nation in such an immoderate way. His comment also reveals a deeply ingrained dark attitude toward women, and shows that he is not above using hateful language, exactly the thing he criticized Coulter of doing. Edwards also erred in sending his wife Elizabeth out to respond to Coulter’s criticism of him, rather than doing it himself, and doing it in an acceptable way. I don’t fault Mrs. Edwards if she wants to campaign for her husband and support his candidacy despite her ill health; that is her decision. And I won’t criticize Edwards for going ahead with this campaign even though his wife has a serious disease; that is their decision. But putting Elizabeth front and center in his campaign looks like a shameful attempt to educe sympathy and turn it into votes. Add to all of that his high-living lifestyle and his pandering to the poor, and Edwards reveals himself to be much less than the image he is trying so desperately to maintain. If John Edwards really is the man Democrats think should be President, it will clearly show that the party is much further to the left than a lot of us would have imagined.